Worldwide Ace » What you say!? So Bush nominated another supreme court judge. She’s definitely been in bed with Bush for a while. Unfortunately for him, she’s an uber-conservative, which means missionary only, no toys, and definitely no kissing on the lips. While at Old Chicago’s, Denise and I were watching the news and the following conversation ensued about the new nominee. Denise: She is ugly. 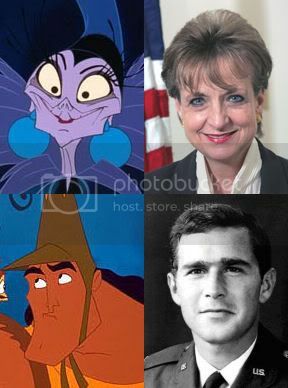 She looks a lot like that old lady from Emperor’s New Groove. Me: I can see that. It’s funny. Bush kind of reminds me of Cronk. For great supreme court justice. I was going to make an ENG quip, but the preceding conversation has left me slightly shaken and confused. Sorry. Sometimes All Your Base can be a derisive and destructive force. And I should mention the ENG portion of my post was added post-AYB commentary. Wow, word up. Had the muddied mass that is Disney slipped upon a vision of the future?